Front Squat, 5,3,1,1,1 Repetitions. Go heavy and set a new 1RM Personal Record. Note: Notice we are doing our strength training at the end of the metabolic conditioning. This forces us to develop strength at a high heart-rate and has immense “real world” application. Use the rack ONLY on the heavy 5,3,1,1,1 repetitions. On the timed evolution, men’s prescribed weight is 95lb. and women’s weight is 65lb. Athletes striving for Advanced Level should challenge this workout and use the Double-Under skill. Who can Front Squat over bodyweight and complete this workout, as prescribed, in under 7:00? Between the hours of Friday August 28, 2015, at 6:00 PM and Saturday, August 29, 2015, at 6:00 PM (24 Hours) CrossFit Amundson will be hosting a 24 Hour AMMAP (As Many Miles As Possible) benefit for Nicole Brown. This incredible event will allow Athletes to either Run, Walk or Concept 2 Row as miles as they can during the 24 hour window of training time. 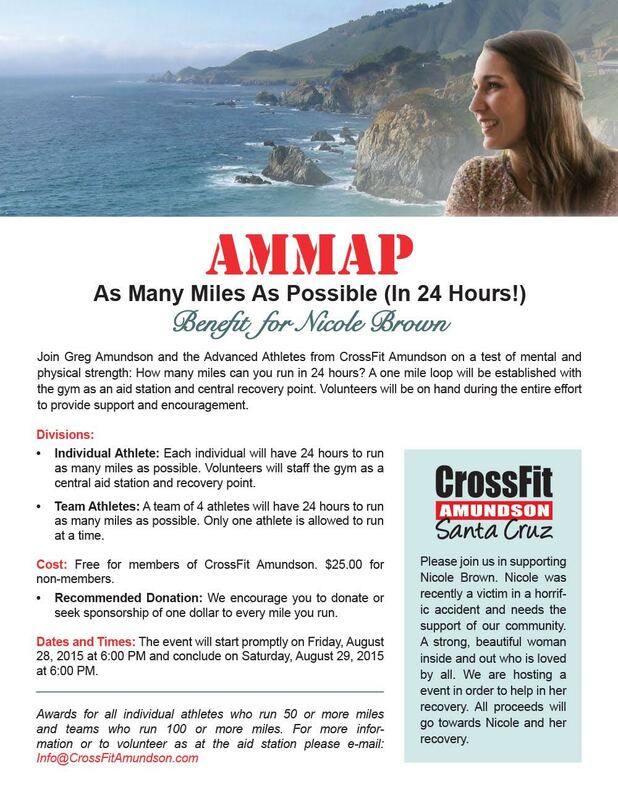 Each Athlete is asked to donate $1.00 or more for every mile they accumulate, with all proceeds to be donated to Nicole. In addition, Athlete’s are encouraged to have their friends and family, as well as local businesses, sponsor their effort. Any questions, please check with Greg Amundson or Bronson Wilcox. More information will be available soon. Our CAMP session today will be our HQ programming. Complete 1:00 At Each Station. No Rest Between Stations! Note: Tonights LIGHT workout operates like the famous “Fight Gone Bad” workout. The first round will be “One Minute On – One Minute Off” and the second round will be without rest.